Browse content similar to The Best Bits: Northern Ireland. Check below for episodes and series from the same categories and more! It's cold outside, but here's something that will cheer you up. and a Children In Need fundraising extravaganza. and welcome to Children In Need 2016 - The Best Bits. We've got plenty of fun. But, more importantly, we've got you, the fundraisers. Welcome to the Big Belfast Children In Need Quiz. but he now lives in LA. And, boy, are we glad! And you will be too. Here he is performing, When We Were Young. # Do you still care? and encourage skills in film-making, animation and music. or opportunities as those in the city. I heard some of you talking about the story so that was really good. to some of the most disadvantaged areas in Northern Ireland. First up, an introduction to animation. It gives them a taste of each. They can really spark off that interest and passion. For our budding film-makers, it's a lot of fun. We are making a short movie. We have wee characters. We put them in and tech capture and they become part of the movie. You have to take piles of wee photos. Oh, sorry, it was me! Maybe in a couple of years I can be a director. An old-fashioned technique given a modern twist. We're using characters and backdrops cut out of card. a story and they make those characters move. It's like a shadow puppet theatre. Whoo! Pretty scary stuff. But it still needs a little something. we have to add some sounds in. packets of crisps, things like that. They bring it into their movie. Digital programmes like this, I think, are essential. but also gaining new skills. ..innovation, self-awareness and self belief. And really just a confidence in themselves. programmes make with the young kids. It really makes my job enjoyable. providing more opportunities for young people. with a very spellbinding tale. Please get behind this year's Children In Need. Come on. -I love Children In Need. I'm going to speak to Pudsey. I'm going to call the BBC. Is there a runner about? You wanted me, Mr Redmayne? No. Sorry, I didn't mean to bother a Paralympian hero. I was just looking for my phone. Hi there. It's Eddie Redmayne here. I'm just trying to get through to Pudsey Bear, please. Any idea how we use this thing? after we lost our last one, you said you knew how this all worked. Shove off! I'm having a massage. Sorry, Bruno. A bit more lavender oil? Oh, hi, Mary - yes, thank you. That would be lovely, thanks. Pudsey, Pudsey... Let's try this one. Good evening. Nonnatus House. Sister Juliet speaking. Um, I'm guessing that you're not, um, Pudsey. -He's a big yellow bear. Must have a fever, he's hallucinating, poor thing. Semi-invisible, beard, squirts ink out of his belly button? Let me guess, let me guess, let me guess. Gelatinous! Large hat, loves custard. Yellow, furry, spotty eye patch? Yes! Yes, that's him - have you seen him? Destroyed three galaxies with his mega-sonic death ray! Right. Then...no. That's not him. Well, I don't know who you're talking about. Thank you very much for your call. Have a good life. -a trans-dimensional vessel such as the TARDIS? Might be because I spilt my banana milkshake on the console. Orange and raspberry Victoria sponge sandwich cake. Wowzer, Mary, thank you. Yes, please. That looks delicious. -You'll have to be quick, I'm reading the news. We can't seem to find Pudsey Bear, have you seen him, by any chance? What? I think you've got the wrong number. Breaking news. Pudsey Bear has gone missing. Coffee and walnut cake, Mr Redmayne. I think that's great, but that's quite enough cake, thank you. I'll just pop it down here, should you want it. Hi, there - it's Eddie Redmayne here. -I'm looking for Pudsey Bear - is he there, by any chance? I like you, but I'm afraid it's a big fat no from me. -Come on, make it quick, I'm busy. I'm just trying to speak to Pudsey. Well, it's obvious what's happened here. -by the twit twins at the BBC switchboard. lack of leadership and for that reason, you're fired. Was he talking about us, or Eddie? -Was he talking to me? Eddie, hello. We're struggling to put you through, but I'm going to put you on hold. They're not picking up, I think we'll have to try another one. Hello? You've reached Major Tim Peake. In space. Over. Listen, I thought you were back on Earth, now? It's just... I really miss space. Well, don't let me disturb you. Hello, you're through to national treasure Graham Norton. Graham, hi, there. Eddie Redmayne here. The Redmayne, Red-mundo, Ready Eddie, Eddie Rec! Ready Steady Eddie, ready... Yeah, I'm sort of done now. Thank you. -Oh, I can help you with that. Up you get, old girl. Madeira cake with candied citrus peel. No more cakes. I'm full. -this table is full anyhow, thank you. no more cakes after this one. -That's my phone. Chuck it here. Technically, we have no idea what we're doing. Oh, you can say that again. -Get off MY leads. MY leads! I'm just trying to get hold of Pudsey Bear. and a shrine to Pudsey? Well, you know, you're wrong, OK? Bye. There's only two sockets left. Well, there's a very high chance this next one is going to be Pudsey. we are taking requests all day long. We have our first caller - what is your name and where are you from? My name is Eddie and I'm from London. -Eddie, what song can we play for you today? Sorry, by Justin Bieber. Perfect choice, Eddie. Here it is on Radio 1 - enjoy! Right, no - absolutely not. I do not want any more cakes. It's more of a biscuit. I'm done, thank you very much. Sorry. I won't interrupt you again. Mary thought you might like a slice of Battenberg cake. -I'll just leave it here. Er, sorry, Eddie. I think we've got it. Is Pudsey with you, by any chance? Then how are you speaking to me? Oh, right, no, I get it. I see. Basically, it's Mel and Sue's fault. Eddie? This is definitely Pudsey. I love Children In Need because of Pudsey Bear. Children In Need means to me helping children with less opportunities than I have. and do lots of exciting things. that you've never done before, just to help others. Being part of Children In Need makes me feel proud that I get to make a difference for someone else's life. of the ways you've been raising our much-needed donations. Scotland and Wales sang out across the land. so let's meet our choirs. ALL: Welcome to Carrickfergus Grammar School! We are St Patrick's Primary School in Drumgreenagh! Welcome to Our Lady and St Patrick's College, Knock. Junior School Choir Of The Year 2016.
and you can lean on me and it's uplifting. And this choir's singing proved to be music to the judges' ears, too. Dalriada were awarded Radio Ulster's Senior School Choir title. Being part of Children In Need is absolutely amazing. choir were involved in Children In Need, so a big welcome back to them. it's very loud and energetic. aren't as fortunate as ourselves. are in fine voice, too. it's a nice song, so I think they'll really like it. so they'd be quite proud that we are doing it for them. And we are. Proud of you all! All that hard work in rehearsal paid off. it's the BBC Children In Need Choir. on it and it makes me just feel privileged to be given the chance. To be given the chance to get involved and have some fun. know that I am making children's lives better across the UK. challenges in their lives to have a bit of fun, a good childhood. neglected, or are living in poverty, or children who have disabilities. This year, yet again, we are humbled. for having fun and giving your money to such a good cause. and also it's just really fun to be involved in. -Pudsey headbands and stuff in the shops and you're like, "Oh, it's time." Keeping It Country for Children In Need. the Belfast Community Circus School. -And, Paul, you've been balancing to raise some money. unicycles, juggle and stilt walk. And what have you been doing to raise money for Children In Need? -just everything that you do to raise money. -Have you raised much so far? We're still counting but it's going to be a substantial amount. Tell us about the skills you're teaching kids. Well, a range of circus skills. Most of them you'll have seen on TV. others will be in outreach projects, community centres all across the north of Ireland. all those skills we're performing in our circus school and teaching. -So it literally does affect lots of kids. There's a huge amount of benefits to learning circus. social skills, and it's keeping them fit and healthy. the beauty of our countryside and, in this case, our generosity. to the north coast recently to take part in a Children In Need ramble. A great walk for a great cause. Millions of years in the making, shaped by elemental forces. Northern Ireland's Causeway Coast is a landscape of rare beauty. -in aid of Children In Need. with its unique basalt columns. ending at the world-famous Giant's Causeway. So you have actually maybe started something for me. and they're raising money to support charities close to their hearts. -It's not too bad, so it's not. -I am, yeah. It's lovely here. -Because you suffer from quite severe arthritis, don't you? Is this painful for you, doing a walk like this? Not at the minute, but it'll probably hit in the morning. Keep taking a little break and you should be all right. and 12,000 of them are children. when she was first diagnosed. their immediate response would be, "Oh, my granny has that." I was first diagnosed with arthritis when I was 11.
daily exercises to strengthen my joints and muscles. and it also affected the growth of my jaw. which can make walking a bit more uncomfortable. when we're out, but they're very understanding, so they are. But Zara isn't letting arthritis dominate her life. as well as offering online support. to me because I didn't really know anyone else who had arthritis. isolated and hopefully feel more confident about their future. just completely different from what I'd normally do. She has just grown and grown as a person. that she's turned into today. Children In Need youth panel. And some of her friends from it joined us on the ramble. Why did you want to be involved in the youth panel, Zara? It's such a worthwhile opportunity that came about. Northern Ireland that don't really get a say. know how far along the organisation would have been without it. ..the awe-inspiring vista of the Giant's Causeway. to marvel at this jewel of the Antrim coast. leaving behind one of his huge boots. -How many stones are there? about how these unique rock formations came to exist. They were formed by volcanic eruption. rocks will always form in sort of hexagonal patterns. How many people come here to see them? It's probably getting towards a million people a year now. -Plus our little team, as well. And so our exhilarating walk draws to an end. for taking part in our Giant's Causeway ramble. you've been raising our much-needed donations. OK, guys, we're going to make some more scones. -We have some little gingerbread men here. It's all for Children In Need! Let me see you all take a big bow! part in it. It's just a good bit of fun, so it is. Mae Murray's granddaughter has cerebral palsy. had a fun and positive quality of life. experienced fun things in life that many of us take for granted. # And where do we come from? Today is part of our all-ability short break residential. some of them quite complex. either at all or maybe since they were quite young. towards people who are able-bodied. is a huge difficulty and that would put families off straightaway. and be part of your family, just like anyone else would be. we were able to purchase a unique piece of equipment. It's a first for Northern Ireland. It's a sit-down surfboard. but we've been able to get hold of one. this is certainly a positive start. and she was quite shy the first day I met her. and she's so kind of confident in herself now. even in the short period that we've been working with her. and support that people need. we would not have had the money to purchase this board. we would never have been able to access this style of surfing. and we've provided that, then that's all that really matters. people of restricted ability right through. And this board will be used for many years to come. Thank you, Children In Need! Hands up for the beach! And as you can see, your money really does make a difference. Raising a smile and raising donations. And this is how you did it. -We love Children In Need! Being part of Children In Need makes me feel amazing. Being able to make others happy makes me happy. a good deed for children who aren't as well off as us. brightens people's days and it makes people feel happy. me feel honoured and happy that I can help others around the UK. Now, when Eamonn McCrystal flew in today from America, he wasn't alone. Also on that plane was the beautiful and talented Chloe Agnew. So here they are together singing We've Got Tonight. Chloe Agnew and Eamonn McCrystal. # Why should we worry? # Why don't you stay? and her big brother Finn. put a smile on their faces. Finn, what are you doing? This is you and me riding a motorcycle. You have a blue one and I have a red one. You can barely reach the handles. What age were you when you did that? I would say I was about seven. I was about seven. You're the wee best sister I could ever have. When Elodie was born, her eyes were small and unfinished. followed a few months later by the other one. This is me pulling a chariot. of her sight and she will lose all her vision eventually. -You could do lots more stuff. I want a trombone of my own. For Elodie, being blind is not just about a loss of vision. of helping Elodie to achieve independence. And that's why music entered Elodie's life. a project that is supported by your donations. It's not just about playing instruments. There's a lot going on under the surface. They're feeling new things, they're hearing new things. But it's also so much fun. And the fun continues at home. Elodie is just the happiest girl in the world. She's finding out new things about music every day. She discovered what she really, really, really enjoys. The workshops helped Elodie develop a love of music. We've noticed her confidence really growing in the last year. it just makes me think, "We can do this. Her future is bright." can enjoy the benefits that music can bring. It's Children In Need day and I need your help today. I want you get in here and give me as much as you possibly can. Mr Auctioneer, you do your worst. This, that or the other. but we'll take less if we don't get it. And you see, this is what it's all about. It's for Children In Need. Get in there and give us a bit. You know, the money you donate, it really does make a huge difference. It's life-changing for many children. for Leo and his mum in the Cloverhill hostel in West Belfast. and so when I came in here, it was a fresh start. obviously it's a very traumatic time for them. More than likely, they're coming from a crisis. Roisian would be very typical of the young people that we help. Young mums who are starting out for the first time in life. -What does the duck say? if you have family problems. She's brilliant. She does a load of stuff. Aren't you, wee son? He's an absolute credit to you. He has come on leaps and bounds and it's your hard work and all, too. It's good that you're not alone. with a child support worker. The impact that that has made has been phenomenal. he was talking, but he wasn't saying many words. It was the same words now and again. It changed him completely and his speech is just brilliant now. He loves books and he will read a book to me! He will! for him to have a conversation with other kids. When I moved in here, I had to do everything myself. We had a cookery class and it was like a healthy cookery class. He used to be a terrible eater. When he was a baby and we used to do spoon feeds and all, no go. When he helps me, he can't wait to eat it. Do you know what I mean? Because he's prepared it with me. for...to have someone that you can talk to who doesn't judge you. We want to see people going out through the door. a better mummy and him settled in the school. have a new home sometime soon. and where he works and if he wants to push himself, it'll help them. the challenge of fundraising with enthusiasm and a real sense of fun. We are also in awe of those who carry out life-changing work. we've got something just for you. Chloe Agnew singing What A Wonderful World. # I see friends shaking hands saying, "How do you do?" # What they're really saying is "I love you"
Oh, wasn't that beautiful? I've got goose bumps. At the start of the show, I told you we had music and magic. changes for the better, for children in need. -And we've had fun too, haven't we? Jo Scott and Barra Best introduce highlights from this year's Children in Need fundraising extravaganza. 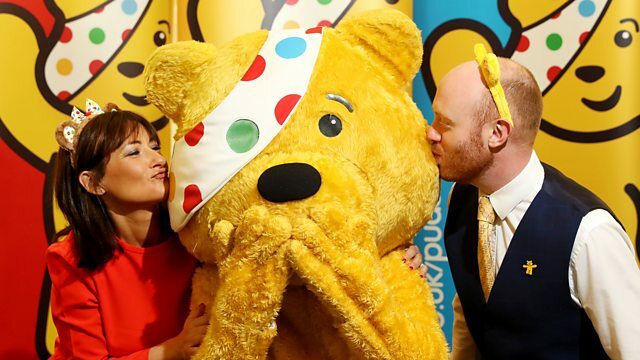 We find out how your donations help children in Northern Ireland, and we'll have fun and fundraisers, music and magic, the 2016 Children in Need choir and of course Pudsey will be there too.